So I took another long history walk over my lunch hour to Carle Park in Urbana. It's located in a quiet residential area of Urbana, across from Urbana High School. 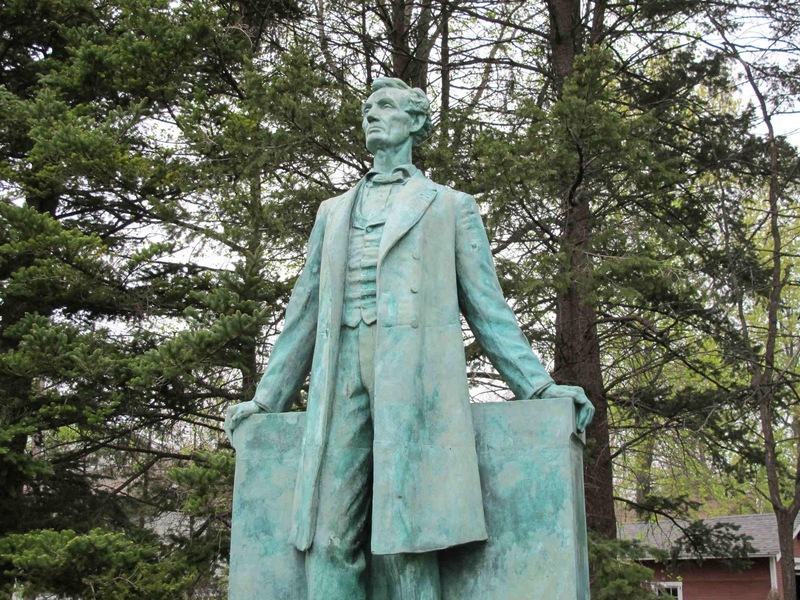 I'd never been there before, and I found quite an unexpected surprise in this beautiful eight-acre park that was established in 1909--a famous bronze of Abraham Lincoln sculpted by famed artist Lorado Taft. 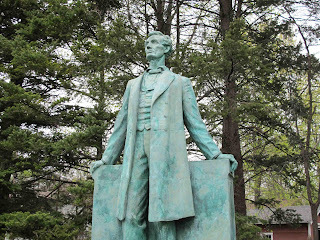 Lincoln the Lawyer is a remarkable statue--Lincoln seems relaxed wearing a bow tie and long coat. He's leaning against the ends of a large slab, and one knee is bent as he gazes over to his right. It's a stunning statue, and recently underwent restoration. The artist, Lorado Taft became interested in art at the University of Illinois. His father was a professor of Geology, and as a fourteen year old boy, he help unpack, repair, and arrange the first sculpture collection at the University. 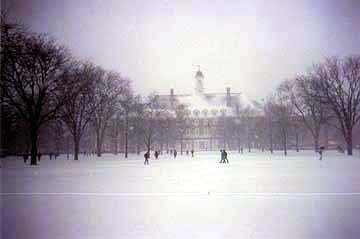 He earned his bachelor's degree and his master's degree at the University of Illinois before going to study in Paris. He later became an instructor at the Art Institute of Chicago. He became very famous in his lifetime, and when the World's Fair came to Chicago in 1893, he became the superintendent of all the the sculpture for the exposition. Taft's Lincoln the Lawyer bronze has an interesting history as well. It was originally displayed near the Urbana Lincoln Hotel, which was the original location of Kerr's Tavern (very near the courthouse where Lincoln practiced)--the tavern was place Lincoln was known to frequent while he was riding the circuit. The statue was dedicated in 1927, but later, there were some squabbles over the ownership of the land the statue was on, and it was moved to Carle Park. 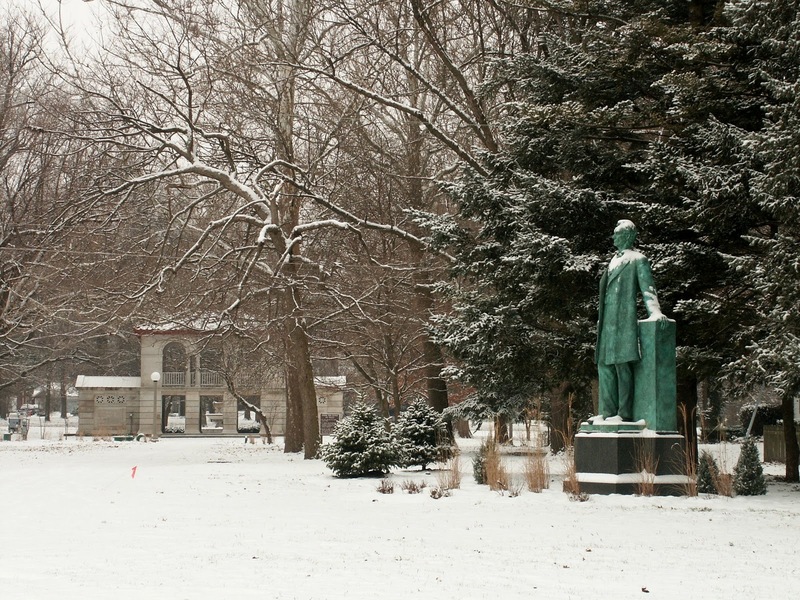 At the statue's original dedication, Lincoln scholar William E. Barton described it best. He said, "Abraham Lincoln comes to Urbana again, where for years he was not a stranger, where lawyers and tavern keepers knew him. Back he comes to permanently abide in the community. Here where his fame increased and his reputation grew with each visit, he comes again and comes to remain." Now I'd tell you more about Lorado Taft, the sculptor, but Lincoln the Lawyer isn't the only mark that Lorado Taft made here . . . in fact, there were several more. Great places for a fat guy to walk and describe to you in future installments of the series. ﻿ In 1950, two armed men, Puerto Rican nationalists, walked up the street to Blair House from opposite directions, intent on killing the four guards, and then assassinating the President of the United States—the man they felt was preventing Puerto Rican independence. The first gunman went up to the guard shack where Officer Lesley Coffelt was on duty. Officer Coffelt was used to people coming up to the booth to ask for directions, and was caught completely off-guard when the gunman suddenly pulled his revolver and shot him four times in the chest, abdomen and leg, mortally wounding him. The second gunman as this was going on, came up behind a plains clothes guard, and attempted to shoot him in the head, but his gun jammed, and the guard was able to spin around and engage him in a struggle for the gun. The gun went off hitting the guard in the knee, but alerting the other two officers. There was a brief but intense gun fight between the two gunmen, and the last two guards—during the gunfight, one of the guards was badly wounded, and one of the two gunmen was also badly wounded, leaving one guard, and one gunman. But the worst possible thing suddenly happened. The sound of gunfire roused the President from his nap, and he walked to the window of the townhouse and looked at to see what was going on. The bad guy that shot Officer Lesley Coffelt in the guard shack was less than thirty feet away, but his weapon was empty. 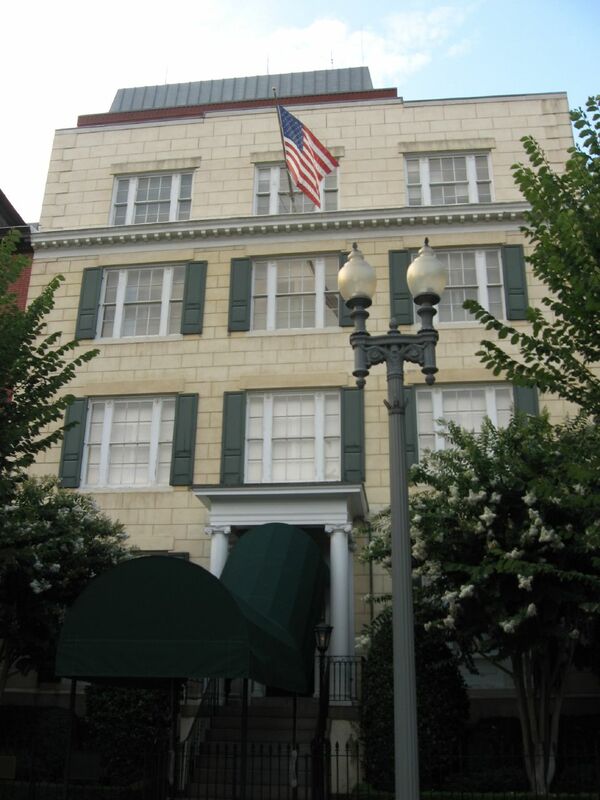 Possibly seeing his main target, President Harry S. Truman, in plain view in the window, he quickly reloaded. The remaining guard didn’t have a clear shot, and yelled for the President to get down just as the gunman prepared to fire. Suddenly, Officer Coffelt stumbled out of the guard shack, wounded in the chest, abdomen and legs, raised his revolver and fired, killing the gunman instantly. It was the last thing Coffelt did. He collapsed, and died in the hospital a few hours later. 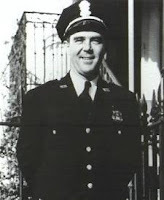 ﻿ Officer Coffelt was a Mason from Potomac Lodge No. 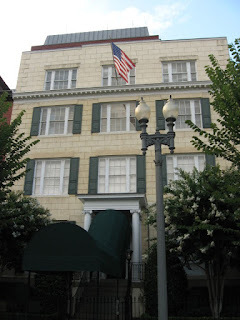 5, Washington, D.C. and the first Secret Service officer to die protecting a United States President. 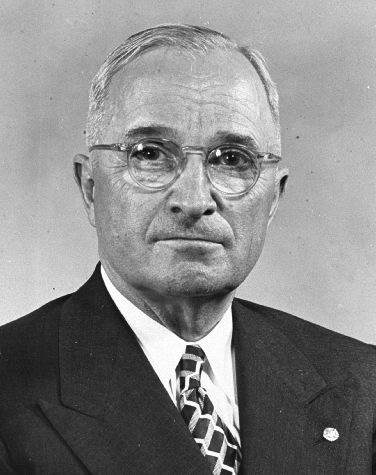 And of course, the President, Harry S. Truman was also a Mason, and Past Grand Master of Mason in Missouri. Three days after the assassination attempt, Harry Truman attended the funeral at Arlington National Cemetery, where Officer Coffelt received full military honors, and Masonic Rites. The seven pall bearers were fellow secret service officers, and all seven were Master Masons. The remaining gunman, Oscar Callazo, recovered from his wounds and was tried and sentenced to death. 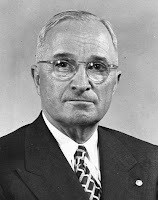 President Harry S. Truman, not wanting to create a martyr or further complicate the problems with Puerto Rico, commuted that sentence to life imprisonment. "I am not & never have been a Freemason." 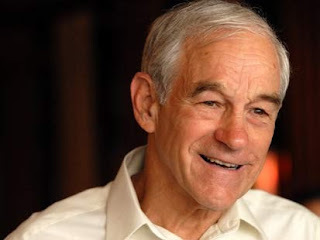 To say I was inundated with responses to my post earlier this week Ron Paul: Freemason Or Not? would be putting it mildly. I thought I'd offer this as further evidence--a note in his own hand. 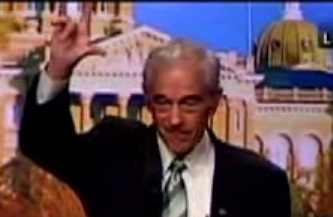 Ron Paul is not a Freemason. Earlier in the week I posted an entry called Hiking Through History: Urbana Lodge No. 157, and in it, I mentioned a famous Freemason from Urbana Lodge No. 157 (IL)--Charles "Chic" Sale. I thought I'd expand on that a bit, in fact, there's a very good chance I'll tell the rest of Chic Sale's story in Famous American Freemasons: Volume III. Charles "Chic" Sale was a vaudeville comedian, and beginning in the 1920s a film actor--he made more than twenty films. He also appeared occasionally in the Ziegfield Follies and the Shubert Winter Garden shows. He was best known for his comedic "folksy" backwater characters, which often included heavy makeup, and he took that talent onto the silver screen when he began working in films. 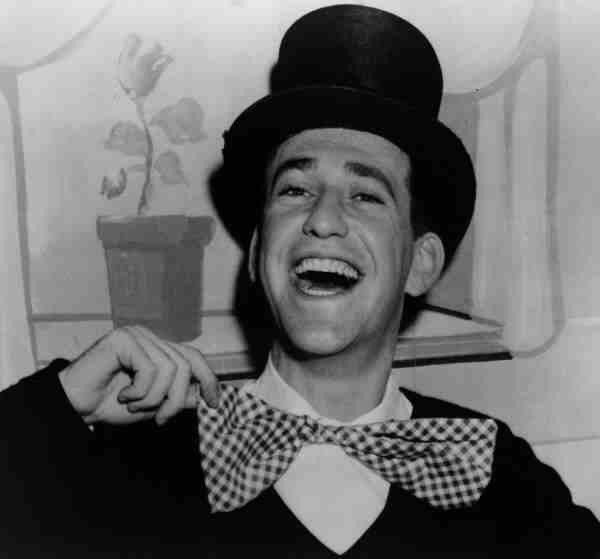 In his best known picture His Nibs, Chic Sale played several different characters in the film--kind of a one man show. But it wasn't until 1929 that he became well-known. Inspired by a carpenter named "Lem Putt" from his hometown of Urbana, Illinois, he wrote The Specialist, a play about an outhouse builder. He knew he had something unique in that play, and knowing that Vaudeville performers were notorious for stealing each others work, he hired a couple newspapermen to adapt the play into a book. The book became a big hit, but was considered very risque at the time--in fact, if it weren't for Chic's careful wording, it would most likely have been banned. The book sold 200,000 copies the first three months after release, and sold over a million copies in total--no small accomplishment at the time. The book made him famous. Although Chic Sale did mostly comic work both as a Vaudeville performer and in film, he did do one serious piece. 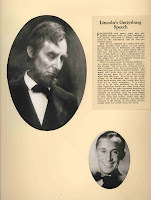 He portrayed Abraham Lincoln in a short film The Perfect Tribute. The film tells a story about how Lincoln was disappointed by the lackluster response to his address at Gettysburg, and shortly afterward, is walking in Washington, D. C. when a young man meets up with him--his brother, a Southern soldier is dying in a local hospital and needs an attorney to take down his will. Lincoln accompanies the young man to the hospital to act as the attorney for the dying soldier, who has been blinded at Gettysburg. Not realizing he's talking to President Lincoln, he tells the President about the speech, and the reason why everyone was so quiet afterwards . . . they were too awed by the President's words to react. Chic Sale was very well known by the 1930s--often his book was the subject of jokes by the likes of Groucho Marx. In fact, he was so revered in his time, that a young comedian by the name of Milton Supman changed his stage name from Soupy Hines, to Soupy Sales in his honor. Fans of Sherlock Holmes know that Sherlock Holmes' greatest enemy was the criminal genius Professor Moriarty. 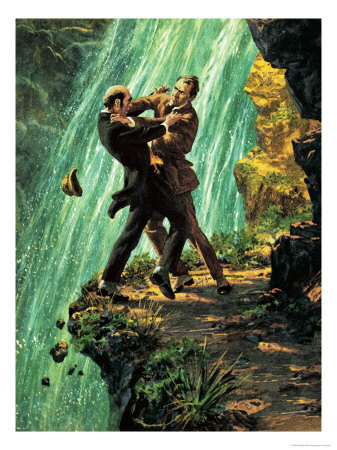 They battled to the death at the top of Reichenbach Falls in The Final Problem, which lead many to believe both men had perished over the side--however, Sherlock Holmes came back. What few may know, is that there was actually a Freemason behind Professor Moriarty's plan to kill Sherlock Holmes. 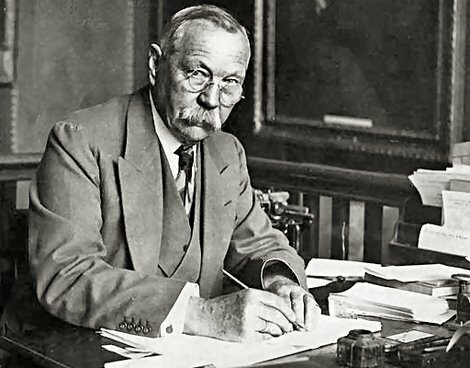 This man had come to hate Sherlock Holmes even more than all the criminals in London combined--his creator, Sir Arthur Conan Doyle! ﻿Doyle enjoyed tremendous success as a writer, and for two years published what is considered to be the best of the Sherlock Holmes stories. But Doyle began to have a love-hate relationship with the character he created. He felt Holmes' success was eclipsing his own, and that the stories were low-brow and were keeping him from producing better work. In 1893, Doyle had decided to kill off the character once and for all--and he did. The newspapers wrote obituaries for the fictional character. Fans in London wore black armbands. Doyle received hate mail, and ever increasing offers from publishers for new Sherlock Holmes stories. But Doyle was determined, and for nine years, the famous detective remained dead. But his writing after he killed Doyle never rose the heights Doyle had believed it would. In 1902, Doyle brought the famous detective back when he wrote The Hound of the Baskervilles, but he made it clear that the story pre-dated Holmes' death. A year later, however, Doyle relented, and brought the detective back to life in The Adventure of the Empty House--seems that Holmes had faked his own death at Reichenbach Falls. 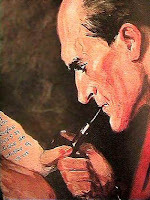 Doyle wrote many more Sherlock Holmes stories until shortly before he died in 1930. To the end, Doyle remained ambivalent towards his creation. "If I had never touched Holmes, who has tended to obscure my higher work, my position in literature would at the present moment be a more commanding one," he once said. "Our country's founders cherished liberty, not democracy." Ron Paul has worn many hats in his lifetime. He's a medical doctor, a U. S. Representative for Texas' 14th District since 1997 (and between 1979-1985 for the 22nd District), an author, and is currently making his third run in the 2012 Presidential election. Of all the candidates, few can claim to have the kind of enthusiastic support as Ron Paul has enjoyed. It's spreading! Would you look at all those Freemasons! 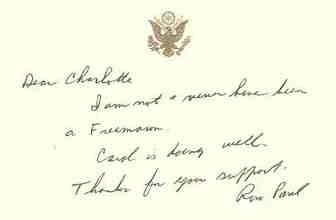 ﻿﻿﻿﻿﻿Ron Paul's father was a Freemason, and Ron Paul himself has spoken out favorably about Freemasonry on several occassions--he's even given speeches in Masonic Halls (which also seems to be used as evidence he's a Freemason). But Ron Paul is not a Freemason, as he himself has said numerous times. So there you have it. Ron Paul is not a Freemason. As I mentioned in my post Hiking Through History (Or Fat Man Walking) I've decided to spend my lunch hours getting a little more exercise, and learning a few things I don't know about the community where I live and work. ﻿﻿﻿﻿One of the first destinations I chose for my daily lunch hour walk was one of the old homes of Urbana Lodge No. 157 in the Tiernan Building in downtown Urbana (IL). And I learned a few things about this beautiful old building, and the history of Urbana Lodge. 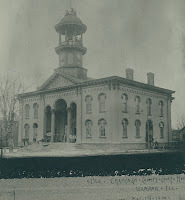 Urbana Lodge is the oldest lodge in Champaign County, chartered in 1854, and the Tiernan Building was actually their fourth home. Urbana Lodge's first home was on the second floor of the Champaign County Courthouse (in Urbana, IL). In 1859, the Masons moved to a permanent home a block away, but in 1871, their lodge was destroyed by fire, along with most of the downtown Urbana area--a fire so severe it has often been compared to the Chicago fire. 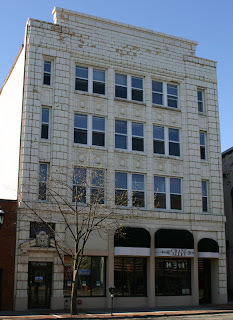 They took up lodgings in the Odd Fellows Hall at 201 E. Main, Urbana (where Busey Bank is now) until they found a permanent home in the Tiernan Building where they met between 1889 - 1979. 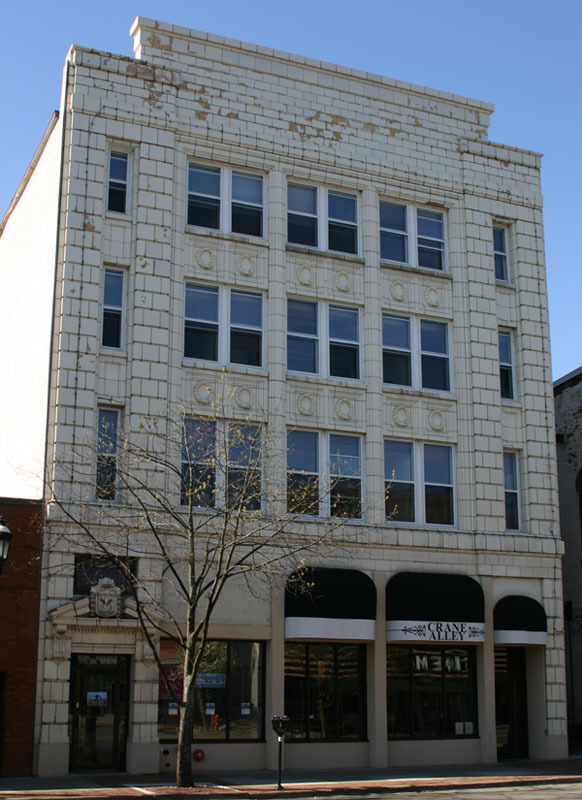 The Tiernan Building was originally a brick building, but in 1914, the Masonic Lodge had the building extensively remodeled, which included the white-glazed terra cotta front designed by Joseph Royer that makes the building to stunning even to this day. In 2001, the building was given the distinction of being recognized as a local landmark. Another interesting fact about Urbana Lodge, was it was home to a famous Freemason. Charles"Chic" Sale was an actor and humorist in vaudeville as well as a character actor in movies. He never achieved a great amount of fame until he authored a risque book on the subject of outhouses entitled "The Specialist." The book sold 200,000 copies in three months and went on to be a million-seller. The book was very nearly banned, but Bro. Sale chose his words very carefully to prevent it from being censored. And, by the way, there is no need to talk about Urbana Lodge in the past tense--the lodge is thriving to this day. These days, Urbana Lodge No. 157 meets at the Champaign Masonic Center at 14 Bel Air Court, Champaign, on the first and third Tuesday of each month at 7:30. "The truth will set you free, but first it will make you miserable." Truth has never been an easy thing, but it's at the core of nearly every faith. Yet, this simple concept revered over millenia challenges us every day. How many times are we asked an opinion by a boss at work, and struggle with the decision of speaking our mind, or saying what we know our boss wants to hear. How many times are we asked if we like the terrible cookies a co-worker brought in, and we simple nod and smile as we choke the rest of it down? How many times do we witness an injustice being done and decide not to involve ourselves? Even the best of us, upon reflection, may learn to our dismay that we're at least somewhat dishonest just about every day. Sometimes it's easier for us to deflect the truth, or sugar-coat our opinions instead of speaking what we know is true. Sometimes we do it out of consideration for somebody's feelings, and sometimes we do it out of simple cowardice. But there is only one truth. It's up to us, each day, to decide what that truth is, and if we have the strength and fortitude of character to speak it, and live it, or if we're to ignore it and go along and get along in a society that doesn't hold the truth is as high regard as as it once did. ﻿﻿ I don't usually do posts over the weekend, but I particularly enjoyed Bro. Steve Harris' post Brother Tom Mix on his One Minute Mason blog today. You should read it--it's an interesting list of facts about the iconic western actor Tom Mix. It's a very entertaining list, and I didn't know most of them, and Tom Mix was one of the Masons I'd considered for the first volume of Famous American Freemasons. Tom Mix was in 336 movies, only 7 were talkies. The only two actors close to that number were both Freemasons. Bro. 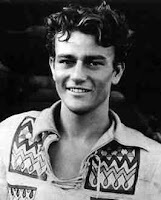 John Wayne was in 170, and the only other actor that's close is the Illustrious Bro. Ernest Borgnine, 33rd Degree . . . who in 2009 was getting ready to appear in his 200th movie--and he's still plugging away at it (when he's not voicing the character Mermaid Man on SpongeBob Squarepants). ﻿Tom Mix and John Wayne were bitter rivals early in John Wayne's career, but it was because of Tom Mix, that John Wayne got started in films to begin with. 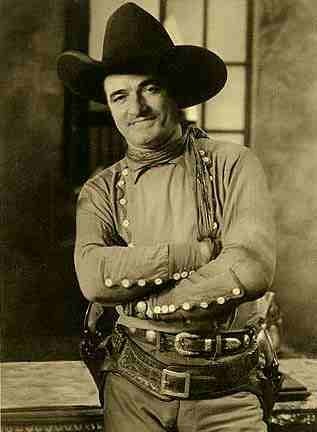 When John Wayne (then Marion Morrison) was studying at the University of Southern California, Tom Mix got him his first job at at studio--as a prop boy. In exchange, young John Wayne got football ticket for Tom Mix. It wasn't long before John Wayne was acting in bit parts, and soon after he began to forge a life-long friendship with legendary director John Ford. His first starring role was in 1930 in The Big Trail. He's almost too young to even recognize in the picture as the legendary star he later became. As Tom Mix's star faded, John Wayne's took off. It seems ironic now, but when I put together my list of famous Freemasons for the first book, Tom Mix and John Wayne were both on the list. I only needed one Hollywood actor for the first book, and John Wayne easily won. My dad is a big John Wayne fan, and as a result, I'm a big John Wayne fan--in fact, the chapter on John Wayne was the very first chapter I wrote for the Famous American Freemasons series. However, when I get to that third volume in the series, I think Bro. Tom Mix will easily make the cut. Earlier in the week, I posted a recipe for King Arthur's Masonic Chili provided by WB Ray Gordon from the Valley of Peoria (IL), which is one of many recipes that will be featured in a collection Taste of the Rite Recipes he's working on--it was a recipe that belonged to Bro. 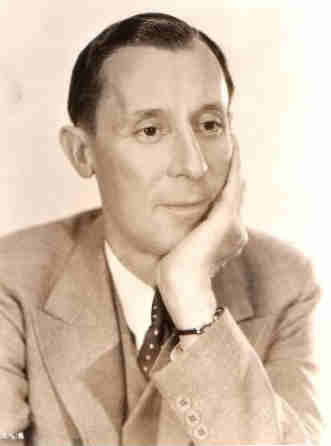 Arthur Williams. It's delicious. Perfect recipe to put in the crock pot in the morning and have hot and ready to eat when you get home from work--especially during this awful, cold weather. Seems to me we started something--there was a lot of response to that post, and another Brother (who will remain nameless at this point) provided another recipe to share! 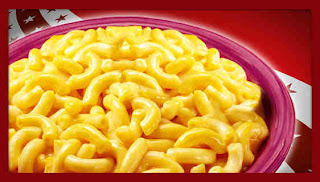 He indicated this is a perfect quick meal after you return home from a lodge meeting (especially if your lodge has a terrible cook). Boil six cups of water. Open blue box. Pour in contents (except for little foil packet--you'll need that later). Boil six to seven minutes until tender. Drain, but don't rinse. Add four tablespoons of margarine, a quarter cup of milk, and the contents of super secret Masonic powder contained in foil packet. Stir thoroughly. Perfectly acceptable to eat right out of the pan while watching reruns of Gunsmoke. Now I would never accuse a brother Master Mason of being deceptive, but there is something about this recipe that seems very familiar to me . . .
﻿You see, over the holidays I came to accept a certain reality--I've put on a few pounds over the last few years. 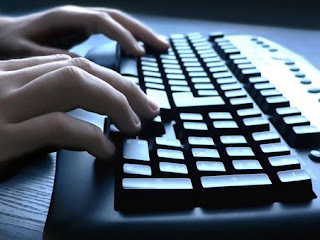 The bad thing about writing, is that it just about doubles the amount of time I spend behind a computer each day, and over time, it's caught up with me. So I've decided, that I'm going to lose this weight once and for all, and part of this plan is that each day, rain or shine, I'm going to walk over my lunch hour--and not down to Dairy Queen for a Peanut Buster Parfait like I used to either. I started last week, and each day, armed with my camera, I found another destination to hike to, and I learned a little something about the place where I live and work. So I thought, at the end of each week, I'd tell you a little something about some of the places I've visited, and some of the things I've learned about them. 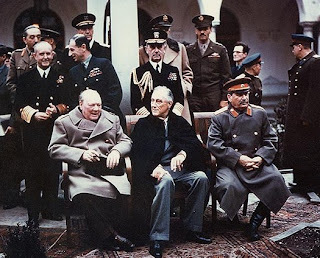 I ran across this photo with the caption "Churchill, Roosevelt, & Stalin: Freemasons." It is well known and accepted that both Winston Churchill and Franklin D. Roosevelt were Freemasons. Churchill was a member of Studholme Lodge No. 1591, England and Roosevelt was a member of Holland Lodge No. 8, New York. So the question is whether Joseph Stalin, the Premier of the Soviet Union who allied with the United States and Great Britain during World War II was also a member of the fraternity. Since the 1950s, Stalin has frequently been cited as a Freemason. However, there is no record that Stalin was a Mason. It would not have been possible for Stalin to join a regular lodge even if he had desired admission. As a condition for membership, Masons must profess a belief in a Supreme Being, and Joseph Stalin was an avowed athiest. What's For Dinner? How About King Arthur's Masonic Chili! Here's a first for the Midnight Freemason blog--a Masonic recipe! My friend WB Ray Gordon is putting together a collection of recipes for the Valley of Peoria (IL) called A Taste of the Rite Recipes. 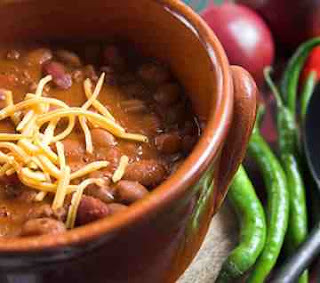 He's giving us a first peek, by sharing this chili recipe of Bro. Arthur Williams. I'll make sure and let you know when Ray's book is complete, and how you might get your hands on a copy. In the meantime . . . how about chili tonight? First brown the ground chuck, then combine all the ingredients in a slow cooker and cook on low for 8-10 hours while you go and Practice your ritual work. 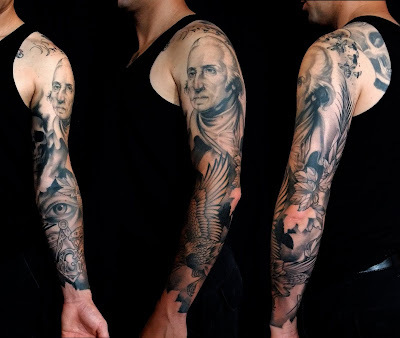 ﻿ ﻿﻿A few days ago, I posted a blog Masonic Ink. Apparently this is a topic many of you are interested in--the hit count went right through the ceiling. I got a lot of emails about it as well, and another photo to share. 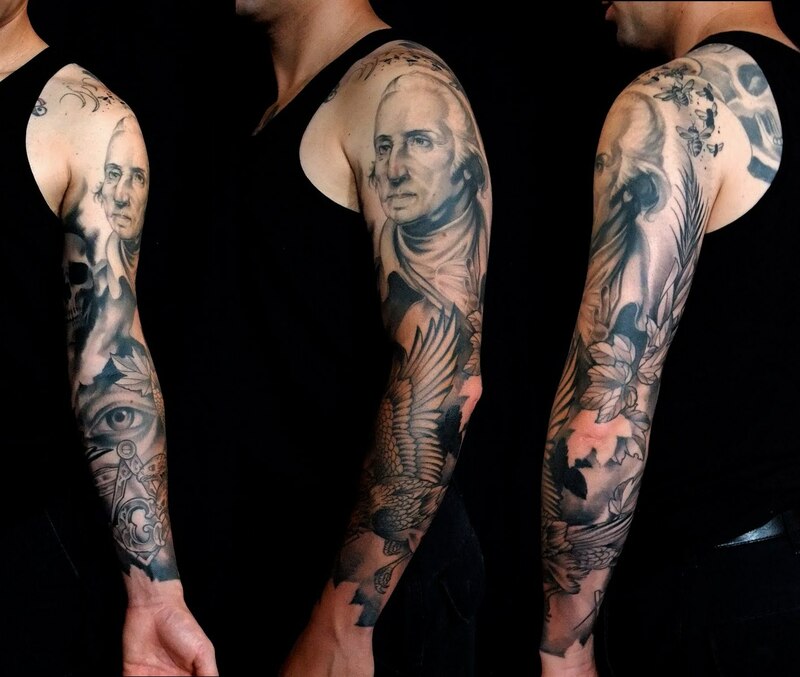 I'd like to thank WB Cory Sigler for sharing this photo of his tattoo. He's a Past Master of Hawthorne Fortitude Lodge No. 200, NJ and he's also the editor of The Working Tools Masonic Magazine which is how we got to know each other (Working Tools just published one of my pieces). So go check that out if you haven't yet. Anybody else want to share a photo of their Masonic ink? Scottish Rite? York Rite? Shriners? Send your photos to me via email webmaster@toddcreason.org and be sure an tell me where you're from, and which lodge you belong to, etc. I've mentioned the Working Tools Masonic Magazine before, and have given it glowing reviews--I like it because it's well produced, and offers a little something for everyone. 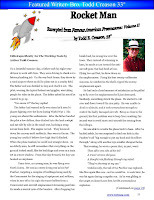 The magazine has been around since 2006, and has published 48 issues to date. Cory Sigler, the editor of Working Tools Magazine contacted me a couple months ago, and asked if I'd be interested in providing a piece for the magazine. 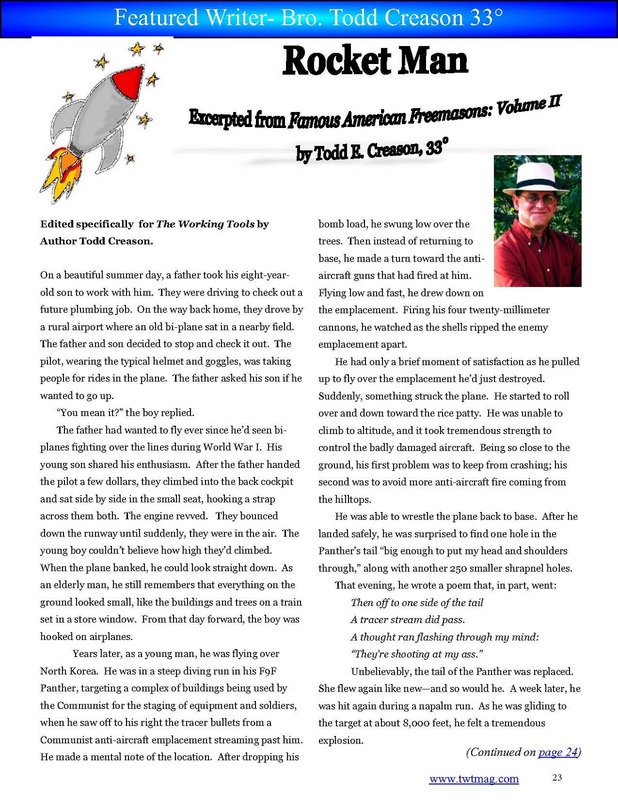 I was, and I did--they published my piece Rocket Man in their first issue (January) of 2012. Cory called me last week to tell me that the January edition of Working Tools Magazine had broken all previous records for hit count in the first week after it was released. So check out the magazine--you'll enjoy it. Working Tools Magazine also has a Facebook page here. "One is never more on trial than in the moment of excessive good fortune." After I'd published Famous American Freemasons: Volume I, and started working on Volume II, a friend of mine (from Covington, Indiana oddly enough) came up to me and said he couldn't believe I'd written about famous Freemasons without writing a chapter about one of our local famous Freemasons--Lew Wallace. I included Lew Wallace in the second volume along with another local famous Freemason I'd missed the first time around--"Uncle Joe" Cannon. I read a really good book about Bro. 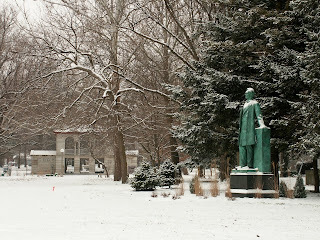 Lew Wallace over the holidays. 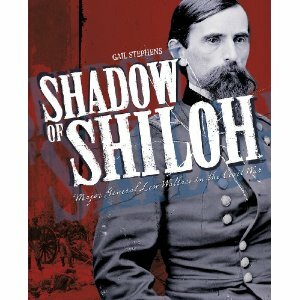 Shadow of Shiloh: Major General Lew Wallace in the Civil War by Gail Stephens. 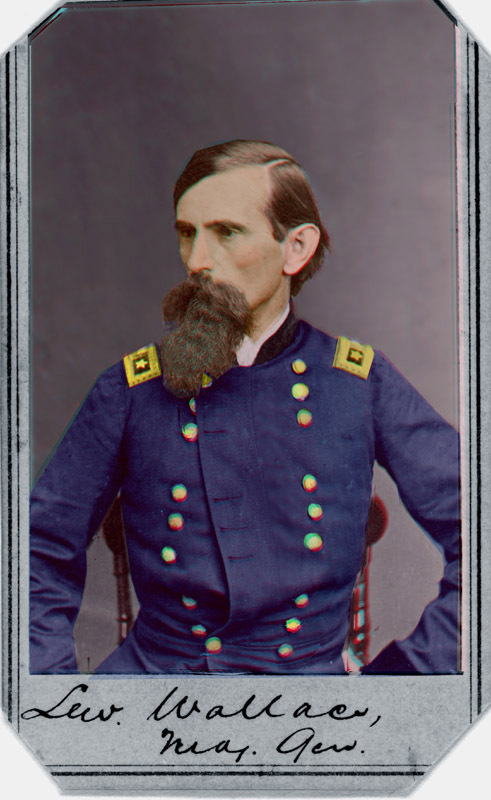 Lew Wallace did a lot in life, including authoring Ben Hur, but there was one event in his life that he never seem to escape from--the Battle of Shiloh. It provides an interesting perspective on the Battle of Shiloh. It's well worth the read. Thirty-two years after the battle of Shiloh Lew Wallace returned to the battlefield, mapping the route of his April 1862 march. Ulysses S. Grant, Wallace s commander at Shiloh, expected Wallace and his Third Division to arrive early in the afternoon of April 6. 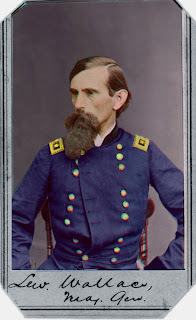 Wallace and his men, however, did not arrive until nightfall, and in the aftermath of the bloodbath of Shiloh Grant attributed Wallace s late arrival to a failure to obey orders. By mapping the route of his march and proving how and where he had actually been that day, the sixty-seven-year-old Wallace hoped to remove the stigma of Shiloh and its slanders. That did not happen. Shiloh still defines Wallace s military reputation, overshadowing the rest of his stellar military career and making it easy to forget that in April 1862 he was a rising military star, the youngest major general in the Union army. 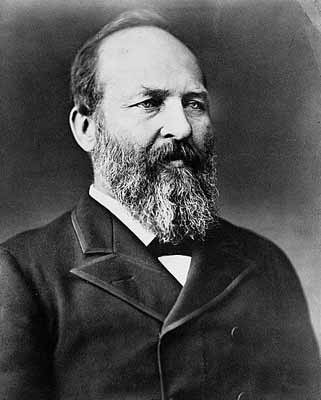 Wallace was devoted to the Union, but he was also pursuing glory, fame, and honor when he volunteered to serve in April 1861. In Shadow of Shiloh: Major General Lew Wallace in the Civil War, author Gail Stephens specifically addresses Wallace s military career and its place in the larger context of Civil War military history. A central issue in the book is the tension between citizen-soldiers and West Pointers that occurred in the officer ranks. The general assumption in current Civil War histories is that the West Pointers were more competent at war than the citizen-soldiers. That was not true in Wallace s case. He had a talent for battle, which he demonstrated at Fort Donelson, Monocacy, and even Shiloh. 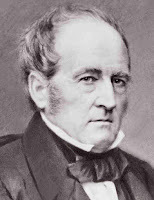 But Wallace s disdain for military rules and protocol and his arrogance, fueled by early promotion, alienated his West Point superiors such as Grant and, especially, Henry Halleck, the general in chief of the Union armies. At Shiloh Wallace was merely one amateur in an army of amateurs. Grant and his staff made errors and Wallace s late arrival was only one mistake of many, but Grant focused on it to shift the blame for the enormous casualties at Shiloh from himself. After Shiloh Wallace left Grant s army and returned to Indiana, giving Halleck an opportunity to keep Wallace out of the field for almost two years. In 1864 President Abraham Lincoln gave Wallace a second chance, and he validated Lincoln s trust at Monocacy. Wallace was an extraordinary man lawyer, politician, general, author, inventor, and adventurer. It is hoped that this book sheds new light on the long-standing issues surrounding Wallace s Civil War career and puts his great service to the nation in perspective. for I've not the time to spare. you'll surely find me there. for I do not know the work. and handle a knife and fork. in the Knife and Fork degree. A Brother sent this to me, and I'm not sure of its origin--all I had was the name of the author. I hope Bro. A. J. Disbow doesn't mind my sharing it. I thought it was pretty funny. It's long been known that Masons like to eat, in fact, we have something called a "table lodge" that allows us on special occasions to eat while we have our meeting. Well, in truth, table lodge or not, we eat about every time we meet, almost without exception. Even if we're getting together on a Saturday to shampoo a carpet in the lodge, I guarantee somebody is going to ask about donuts. There is even an organization called High Twelve International that is basically a lunch club for Freemasons and their wives. A group of us in Urbana-Champaign (home of the University of Illinois) are working on chartering a brand new chapter of this organization called Illini High Twelve. 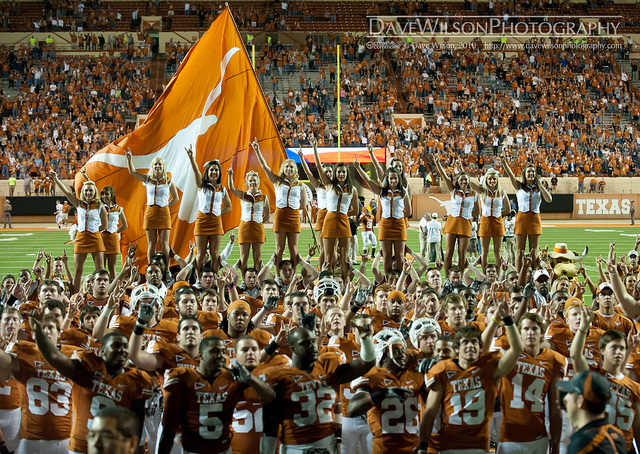 We're very excited about how it's taken off in just a few months. 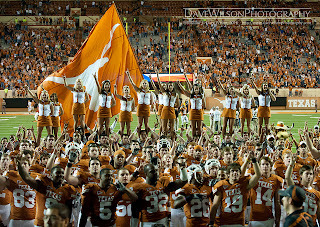 So I'm posting this as an ode to the (hopefully) charter members of the Illini High Twelve in Urbana-Champaign, Illinois. Some have complained that I've made it difficult for people to comment on my blog--I did that for a reason. 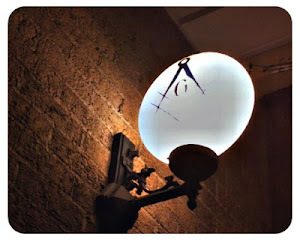 I had a situation a couple months ago where my blog (and my email) was inundated by rude comments from people that obviously were not well informed on the topic of Freemasonry, and do not hold the fraternity in high regard. We'll try this again. ﻿I've made it so that everyone can comment, so please feel free to chime in. Do behave yourself and be polite--and don't forget to sign your posts. If you don't sign your posts, I reserve the right to remove them. I like to know who I'm talking to. Freemasonry: How Far Does It Go Back? 1510 A.D.? I wrote a piece a few weeks ago about an ancient lodge room found in Pompeii that received a lot of favorable comment. I thought I'd explore that question of how long Freemasonry has been around a little further. 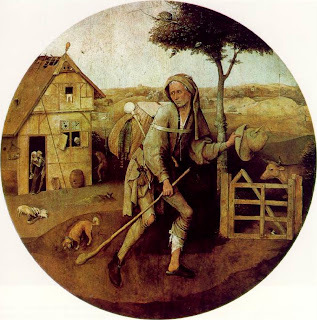 I'm sure there are a lot of Freemasons out there that will recognize this painting by Hieronymous Bosch (circa 1510) called The Wayfarer. It was featured on the cover of a very popular book amongst Freemasons--A Pilgrim's Path by John Robinson. The painting is interesting because it goes back to the sixteenth century, and it seems to incorporate Masonic themes--many are very obvious. John Robinson pointed many of these out in his book, like the brace on the fence that looks a lot like a square. 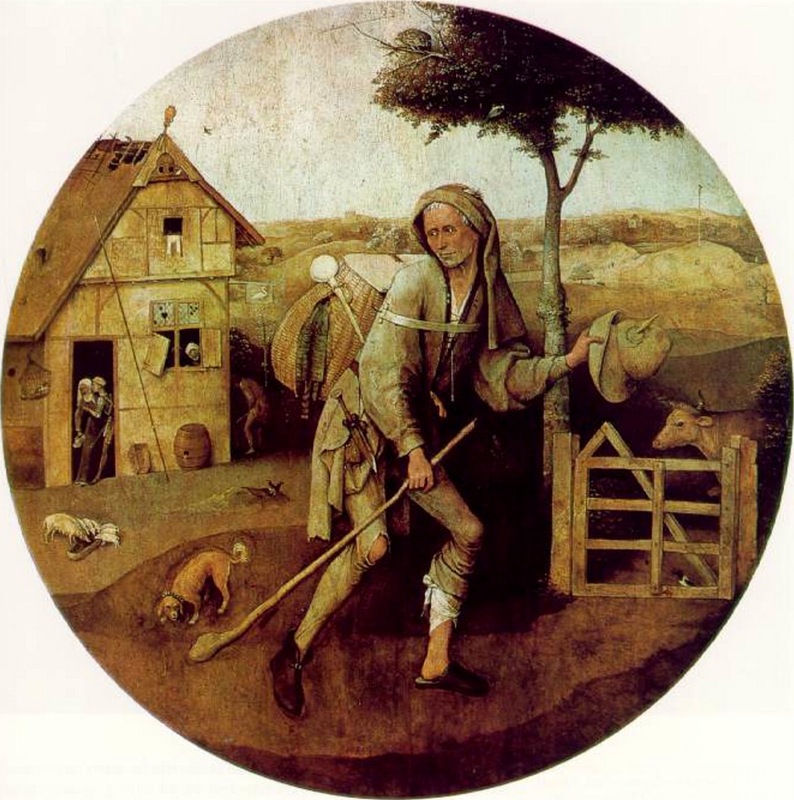 The Wayfarer's attire also suggests Masonic influence. He's wearing a slipper on one foot, and his pants leg is rolled up. He has a plumb-bob in his hat instead of a feather (which is believed to have been a Masonic working tool in the past). Even the way the straps of his backpack come across his shoulders is suggestive to Masons. 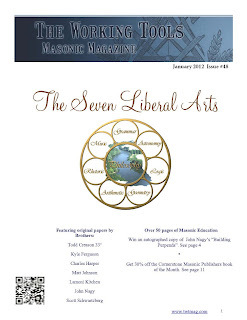 John Robinson wrote more about his painting and the Masonic symbolism it contained here. But I think it's pretty obvious by this painting that Freemasonry was alive and well in 1510. I thought this was a terrific video. It's the winner of the second annual video contest hosted by the Grand Lodge of California F & A M. Participants in the contest were asked to answer the question: What does Masonry mean to you? The winner, Culver City Foshay Lodge No. 467, produced this marvelous video. Congratulations! 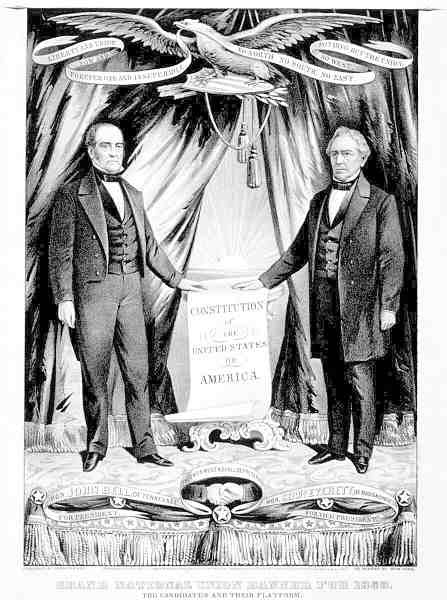 ﻿﻿﻿During the hotly contested election of 1860, a third party was formed to go up against Abraham Lincoln--The United States Constitution Union Party. The party was formed by former Whigs and Know-Nothings by former United States Senator (TN) and Speaker of the House, John Bell. ﻿John Bell sought the nomination, and in the end finally received it after a second ballot. 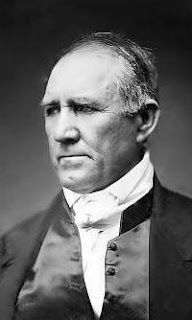 He had a little more competition for the nomination from within the new party than he had anticipated--namely from the larger-than-life governor (and former President) of Texas, Samuel Houston. 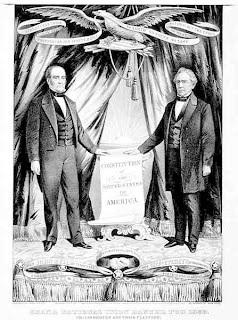 ﻿﻿﻿Of course, in the end, the fractured Democatic Party and the Constitutional Union Party had little chance of succeeding against Abraham Lincoln and the mostly united Republican party that dominated the North. But the interesting thing to note, is that both John Bell, and Samuel Houston were Freemasons.